Home of the first houseboats on the Murray River, a floating cellar door, award-winning distilleries and Australia’s largest rose garden. Renmark is a popular spot for water sports, food and wine and an emerging wedding destination. Click on the map above for directions to Renmark. The first houseboats launched on the Murray River in 1961, Liba Liba, Houseboats are one of the several houseboat fleets based in Renmark, making it easy to hire a floating palace and explore this section of the river by boat. If your looking to get active on the water pedal boats, dinghies, canoes and kayaks are all available for hire but if you’re after a ski boat and equipment it’s always best to bring your own. The Renmark Riverfront Caravan Park and the Renmark Riverbend Caravan Park are popular family waterskiing resorts in summer and perfect locations for peaceful holidays all year round. Steaks are a speciality at Angus & Co in the Renmark Golf Resort which is the perfect 19th hole overlooking Renmark’s 18 hole golf course and a regular mob of kangaroos. Take in a movie or a live performance at the celebrated Chaffey Theatre while enjoying your stay, or ride on the historic paddle-steamer PS Industry when it fires up on the first Sunday of each month and schedules unique day trips upstream to Wilkadene Woolshed Brewery. 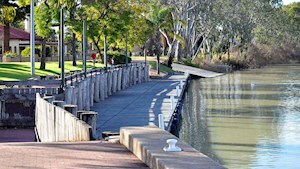 The five-kilometre Renmark Riverfront Town Heritage Walk, also suitable to cycle, interprets historical information about the town and Murray River. This passes the beautiful riverfront esplanade where at dusk a family of possums emerge. There is a number of other walking and bike trails available in the area, with one taking you across the historic Paringa bridge. Renmark also is the starting point for the award winning Murray River Walk, a guided 4 day 3 night walk through ancient red gum forests and spectacular floodplain wetlands. Walks are by prior bookings only, as they walks are only available in the cooler months. Wine lovers will be impressed by award-winning wines at both Angove’s and Mallee Estates Wines while the cellar door onboard the Murray River Queen features hard-to-find Riverland wines. Generous serves of tasty pub grub are on the menu at the Renmark Hotel’s Nanya Bistro and across the road at the Renmark Club. Thai lovers will love the cuisine onboard the River Murray Queen, while Eleni’s at Mallee Estate has authentic Greek food to die for. Make sure you take time to ‘stop and smell the roses’ at Ruston’s Rose Garden featuring – the largest rose collection in the Southern Hemisphere. It is home to the national rose collection and hosts a glorious mix of modern and heritage varieties, as well as a popular vintage car display. In October each year the town hosts the Renmark Rose Festival. The 10-day event features open gardens, an indoor display of cut roses, art exhibitions, self-guided walks, paddle boat cruises, flower arranging demonstrations, local tours and a cabaret. The Canadian-born Chaffey brothers’ original home, Olivewood Estate, is now a National Trust museum. While the Frank Harding Collection presents an incredible bush ranger ceiling mural and a series of aviation paintings. If you want to tour the area by car, follow the 43 kilometre Renmark Tourist Drive, which showcases a mix of attractions, historic buildings and scenic spots. Finally, don’t leave Renmark without visiting Almondco Almond Hut and stocking up on fresh almonds and large range of almond base products not seen elsewhere in the Riverland. Another ‘must take home’ is a bag or two of specially roasted Arrosto coffee from their funky ex Renmark Fire Station café. In keeping with the fire theme, choices include Firehouse Artisan, Ladder 59, and Engine 152 blends, four single origins, and fire chief capsules.